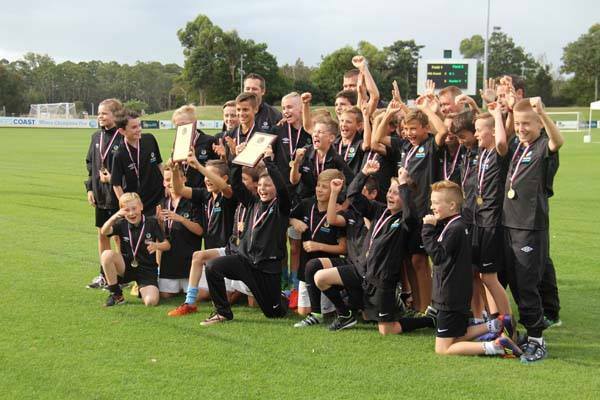 Newcastle Football technical director Richard Hartley said thorough preparations and commitment to innovation helped the zone claim the boys’ 11 and 12 years Northern NSW title double for a third consecutive year. Newcastle’s 11 years won their seven matches and the 12 years edged out the Emerging Jets 11 years line-up to win the titles at Coffs Harbour on Monday after three days of competition. The 12 years finished equal with the Jets on 16 points but they claimed the crown because of a 2-0 win in their match-up. Hartley did not believe the hat-trick double had been done before and he put the success down to “a very thorough preparation” and “strong support from a progressive Newcastle Football board”. He said the preparation included trials against Jets and Sydney teams and three games each day over a weekend a fortnight ago to replicate the tournament. Bailey Newton netted nine goals for Newcastle’s 11 years through the tournament, while Oscar Ward bagged five for the 12 years team, who had 10 different scorers. Hartley was impressed with the overall play at the tournament. “I thought last year the standard in both divisions wasn’t great but it was excellent this year,” he said. He believed more Newcastle players would come into consideration for Emerging Jets places after the success in Coffs Harbour. “Out of our 11s and 12s, 13 of the 26 players had been invited from trials to train with the Jets before the tournament,” Hartley said. The Newcastle 11 years side was: 1. Mitchell Connors (GK), 2. Sam Jackson, 3. Jack Knowles, 4. Lachlan Graham, 5. Matt Kacev, 6. Matt Novak, 7. Ryan Duchemin, 8. Cameron Davies, 9. Oscar Cathcart, 10. Byron Bennett, 11. Mason King, 12. Bailey Newton, 13. Dylan Christoffersen. The Newcastle 12 years side was: 1. Killian McCarthy (GK), 2. Ned Amidy, 3. Daniel Kacev, 4. Adrian Delmoni, 5. Marco Baker, 6. Tom O’Connor, 7. Declan Hughes, 8. Oscar Ward, 9. Pat Farrell, 10. Riley Parker, 11. Jye Rodway, 12. Zac McShane, 13. Zaik Luck.